HAI is proud to announce yet another peer-reviewed publication addressing mental health in Mozambique! Mental health services have been chronically neglected in Mozambique. There are only 15 psychiatrists in public-sector service in the entire country, and in 2011 only 0.16% of the Ministry of Health’s budget was allocated to mental health. In order to assess the current situation, HAI’s very own Brad Wagenaar and Kenny Sherr recently conducted a study looking at current patterns of health-seeking and treatment for mental illness in Sofala province, Mozambique. The study analyzed over 2,000 outpatient psychiatric registries from Beira Central Hospital over a 20-month period in 2012-2014. The study found that treatment for severe mental illness such as schizophrenia and epilepsy dominated psychiatric services. Mood disorders–despite their suspected high prevalence–often go undiagnosed and unaddressed. Bipolar, in particular, was almost completely ignored. This is important as Mozambique was recently estimated to have the highest suicide rate in Africa, and untreated bipolar disorder can lead to a dramatically increased risk for suicide. The low rate of mood disorder identification speaks to the need for better integration of mental health care and screening into primary care and innovative approaches to identification and treatment of these conditions. 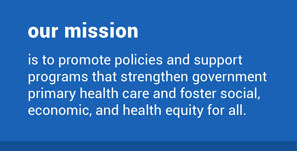 This is something HAI is working hard to achieve as we attempt to scale-up our projects around global mental health. 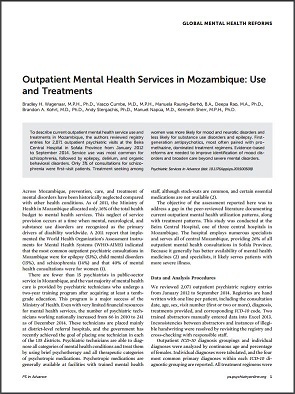 The article, titled “Outpatient Mental Health Services in Mozambique: Use and Treatments” was published in Psychiatric Services in February, and is available on our website.